A Celtic boy takes on the Roman army. Find out about the world's craziest creatures in this laugh out loud book! Read what happens when Clare finds a tiny, injured fox cub. A funny and thrilling folk-tale. A charming story about Alice, a dare gone wrong and one crazy horse. Read the hilarious goings on when Adam minds a pet python. A fun comedy as Robin Hood goes to sea. 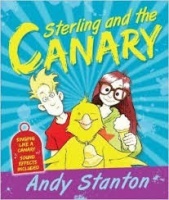 A very funny tale about Sterling and his talking Canary!